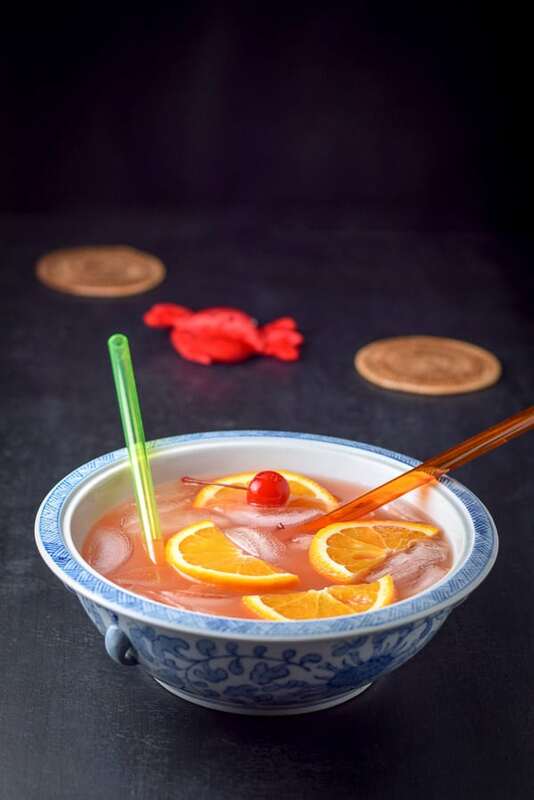 If you are looking for a cocktail that packs a punch, then this scorpion bowl is the drink for you! Almost as dangerous as the Long Island Iced Tea, the only thing that makes it less dangerous is that it is made to be imbibed by two people or more. My sister, Denise, had reached a milestone birthday and she told her daughter that she wanted something special to celebrate! So, her daughter (my niece), Emily decided to buy them both tickets to fly to Massachusetts. It had been 12 years since they’ve been up to visit. They arrived Christmas weekend and stayed through the following Tuesday. That made the holiday more special for our whole family that year. 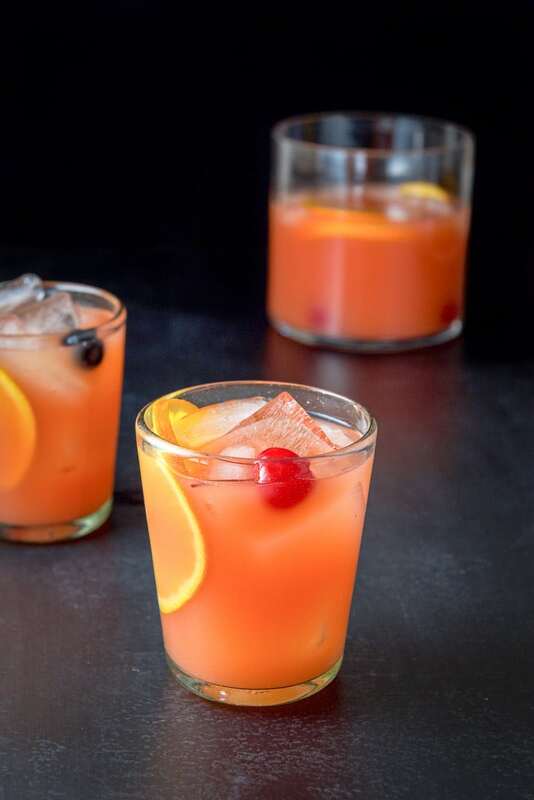 When I decided to make this for my sister – her favorite drink to get at a Chinese food restaurant – and researched the ingredients, what really surprised me was that the recipe calls for gin. Vodka didn’t surprise me. But gin? Big surprise. The first time I posted this recipe, I served the cocktail in a pretty, Asian-style bowl. (Scroll down to see the original photo.) This time I chose something see-through. You can serve it in whatever you want, just make sure your container can hold 28 ounces of liquid plus a bunch of ice cubes. Bowls can be fun to use for sharing this cocktail, but use whatever container strikes your fancy, as long as it holds 28 ounces and some ice. 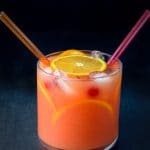 I use more orange juice than usual in this recipe because it’s a potent cocktail and the extra juice nicely balances the alcohol. If you want to make this scorpion bowl less potent, you can safely skip the vodka, but don’t skip the gin since it adds a distinctive flavor. I use both regular maraschino cherries and Luxardo cherries. Remember to rinse them thoroughly before placing them in the scorpion bowl. The syrup the cherries come in is really sweet. And who needs that? Get a big glass mixing bowl and a cocktail spoon. You won’t be adding ice to this bowl but you will add it to the drink receptacle. After you measure the ingredients, add them to the mixing bowl. 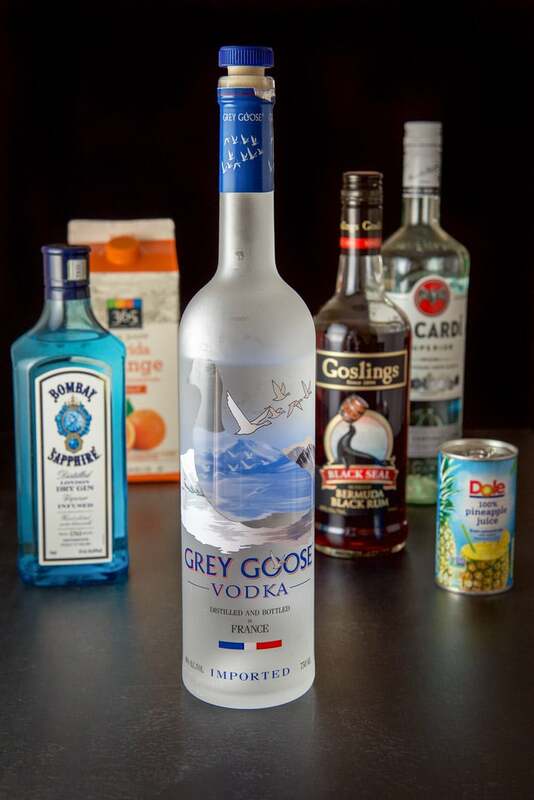 Gather the ingredients – gin, dark rum, white rum, vodka, grenadine, pineapple juice and orange juice. 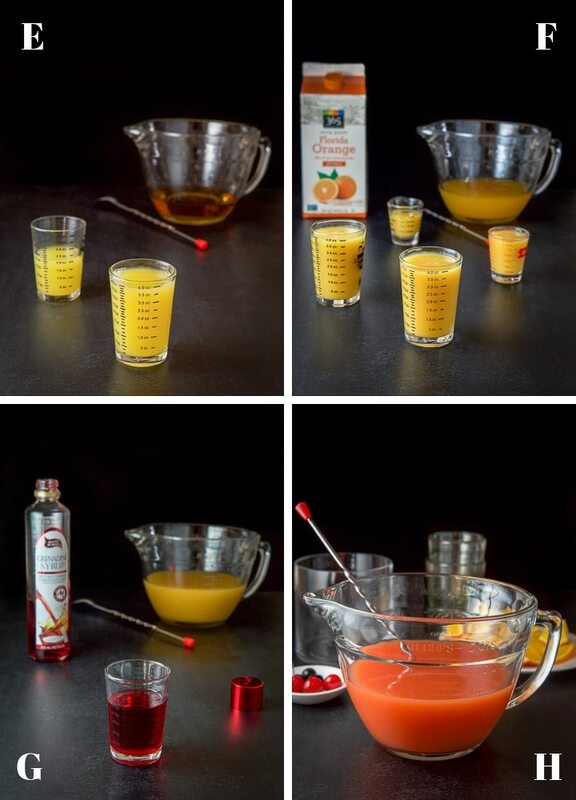 Stir the concoction with a cocktail stirrer, cut orange slices and gather 3 regular maraschino cherries and 3 Luxardo cherries. 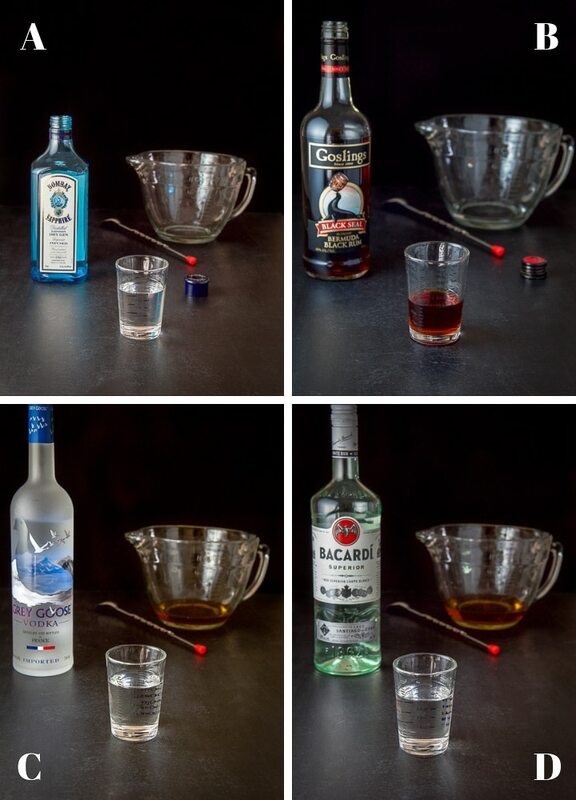 Pour the scorpion bowl recipe into your serving container and add a bunch of ice cubes. I also place the orange slices, cherries and straws. Here is the original photo. Still looks delicious. I like drinking scorpion bowls, but unless I know the person really well, I don’t like drinking it from the same receptacle as they do. So, I usually just pour some in my own glass. Does it still make the cocktail a scorpion bowl? Yes indeed it does. It’s all in the name. I take a ladle and spoon the drink in some glasses along with the orange slices and cherries. And now for the final photo. Let’s look at the vertical photo of the drink in the glasses. I take a sip. Woohee! Even though it has a lot of alcohol, it’s nicely balanced so you have to be careful because if you drink it quickly, you won’t notice the affects until you stand up. I hope you enjoyed this scorpion bowl recipe! Please feel free to leave me a comment what is your go-to cocktail recipe. If you’ve tried this scorpion bowl recipe I’d love the hear what you thought about it in the comments below. I love hearing from you! You can also FOLLOW ME on FACEBOOK, TWITTER, INSTAGRAM and PINTEREST to see more of my delicious food and delightful cocktails! This boozy scorpion bowl is so yummy but extra potent. Usually 151 rum goes in a scorpion bowl recipe but Bacardi stopped making it. I used white rum instead. I use more orange juice than usual in this recipe because it's a potent cocktail and the extra juice nicely balances the alcohol. If you want to make this scorpion bowl less potent, you can safely skip the vodka, but don't skip the gin since it adds a distinctive flavor. Originally published in December of 2016. Scorpion Bowls! Dangerous but delicious! What a fun and refreshing drink! This could really help cool me down after doing a day’s worth of yard work in the hot sun! Looks great! I had such a horrific day at work I could go for 2 or even 10 of these wonderful looking cocktails. Looks so refreshing! Thanks Heidy! Hope your night got better. 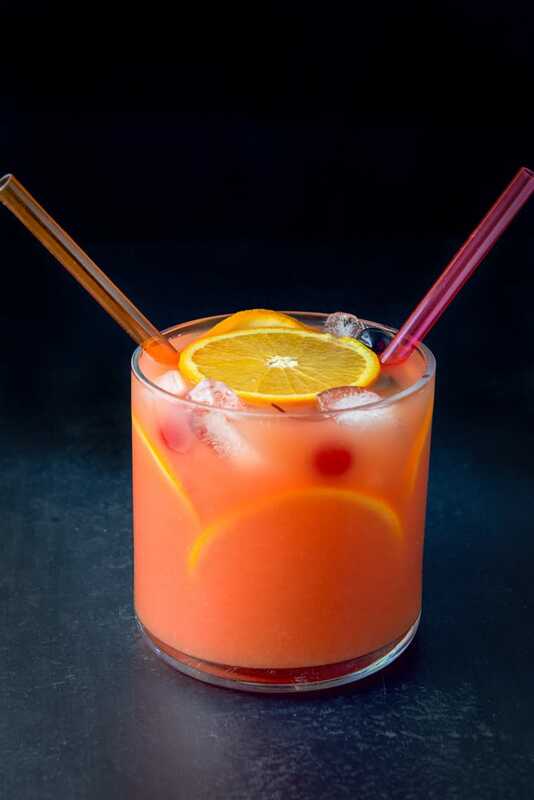 Yes, it’s a fun cocktail to have after a long hard day, but beware as it’s full of booze! Hehe. Thanks Neha! I love Fridays! I decided this punch should be served at my bunco party. They ladies will love it. Yay! Thanks, Jere! I’m sure they will. But I want to know what a bunco party is? It’s delicious, Tisha! And refreshing and fun! Thanks for your comment. I love the idea of a drink that can be shared & enjoyed together. 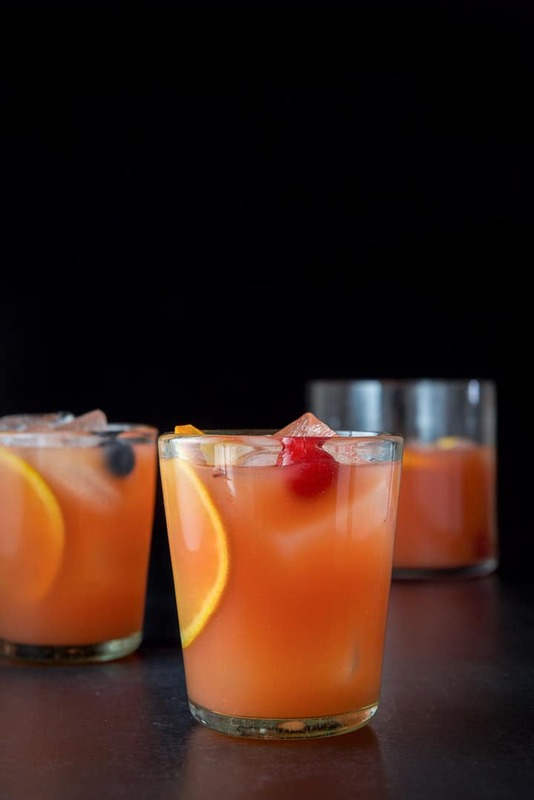 The tropical flavors make this a fabulous cocktail for the warmer weather too. Thanks Sharon! Yes, It’s a great cocktail to share! And it has such a tropical taste! This drink looks amazing! I also love the name – Scorpion Bowl! It’s bound to bite with a sting. How fun to share a cocktail too! Haha! I love that the name of the cocktail gave you that image. :_ Thanks, Kathy, I appreciate it.